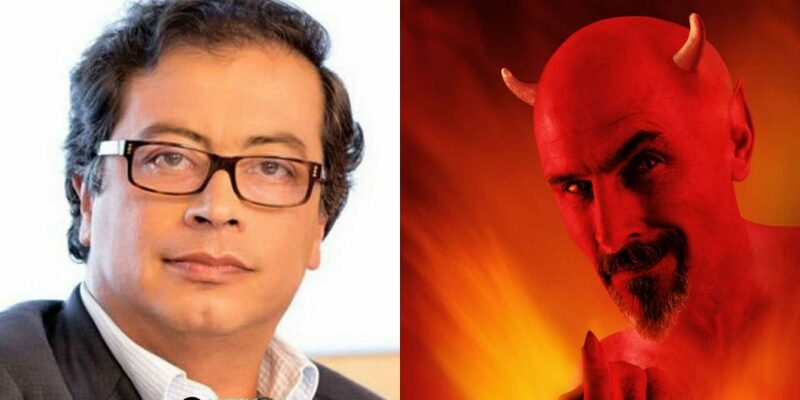 Colombia’s leftist presidential candidate Gustavo Petro is using “satanic rituals and witchcraft” to sway voters to come to his rallies, according to an evangelical pastor. The pastor referred to a video that also claimed the atheist former mayor is resorting to satanism and indigenous witchcraft. “There is a video that is circulating where he summoned, he invited some satanists (…) they is black heavy metal, but heavy, where he invokes Satan and tells him that he wants to see him and that everything is Petro’s,” said the religious leader. According to the video, Petro is soliciting the help of the dark arts and heavy metal bands to bridge the gap between himself and right-wing Ivan Duque in the upcoming elections. The montage attempts to draw parallels between Petro and the late Venezuelan leader Hugo Chavez, a strategy commonly employed by the country’s conservatives and far right. The potential first lady’s “reptilian look” supposedly adds to suspicions that the devil is indeed among their list of political connections. Despite Torres’ call for his supporters to pray against Petro and Satan, and to prevent the mass attendance at Sunday’s campaign rally in Barranquilla. Huge crowds attended Petro’s rally in the Caribbean city. Who does Gustavo Petro think he is? Metallica? Despite trailing in the polls ahead of next week’s elections, Petro has drawn massive support from around the country with thousands gathering to hear him speak at political rallies. Scaremongers have labeled Petro a “communist” amid fears the leftist politician would turn Colombian into another poverty-stricken Venezuela.